However, the good news is – there is something you can do to prevent nocturnal (night) grinding and the damage it causes and those of us at Delroy Park Dental Care are here to help you. Our team can fit you with a special mouth guard to wear while sleeping. A night guard is made by taking impressions of your upper and lower teeth, using a special mold. 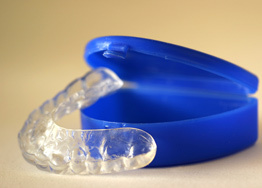 The impressions are used to make the mouth guard so that it fits perfectly to the shape of your teeth. The night guard doesn’t stop the grinding, it just makes sure that it doesn’t affect your teeth! If grinding is a problem for you or a loved one, Delroy Park Dental Care has the solution. Please call our clinic for an appointment to be evaluated and fitted for a night guard. Don’t let teeth grinding become a bigger pain than it already is!